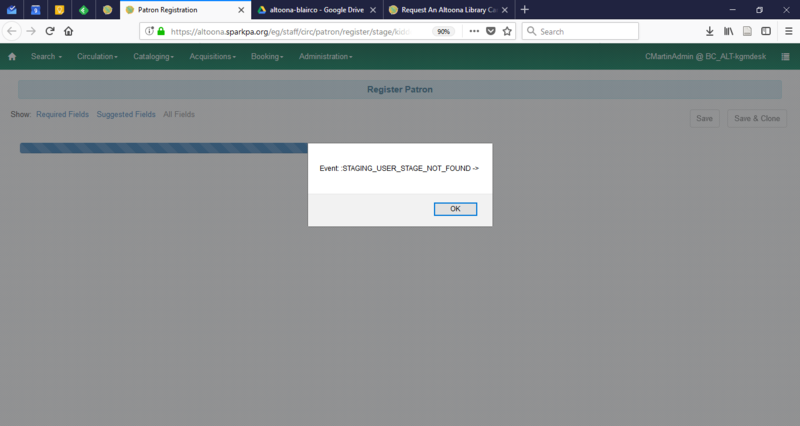 If a patron goes into self-registration feature in the catalog and self-registers and then a staff member goes into Pending Patrons in the Web Client, fills in required fields, and clicks on Save, they will receive a STAGING_USER_STAGE_NOT_FOUND error. The record is saved, but, needless to say, the error can be an annoyance. You load a patron from the pending queue, make any necessary changes, and save. The staging error (screenshot attached) then appears, which gives the impression that the action was unsuccessful (the screen reverts to a new register patron screen). However, when you search for the patron, you see that the card was created successfully, and they're no longer in the pending patrons queue. Here's a patch that addresses the error alert/message and the pending patron grid refresh a user has been fully registered an is no longer pending. Issue was that after completing a staged user registration, the controller in regctl.js was refreshing to the same route, and trying to fetch the same staged user, but never finding it as it was no longer a staged/pending user. Works for me; pushed to master. Thanks Cesar!